"Tekken 6 is a fighting game developed and produced by Namco Bandai, it is the sixth game in the Tekken series. It was released in Japanese arcades on November 26, 2007 and was released for the Xbox 360 and PlayStation 3 on October 27, 2009. An updated version was released in arcade version in 2008 named Tekken 6: Bloodline Rebellion, featuring new stages and characters. A 2008 release was planned for the game. However, at the at the 2008 Tokyo Game Show, it was announced that the game would be released for the Xbox 360 as well, thus delaying the game's release to 2009 (the Tekken series had, previously, been exclusive to the PlayStation brand). On October 9, 2009 it was announced that console-based versions of Tekken 6 (based on Bloodline Rebellion) had gone gold. A portable version was released on the PSP in November 24, 2009. 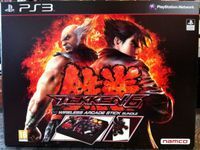 Tekken 6 is the first game to be released on the PlayStation 3-based System 357 arcade board." Source: Wikipedia, "Tekken_6," available under the CC-BY-SA License.